The Sun’s magnetic field is generated via the αΩ dynamo (Parker 1955), which is believed to operate at the boundary between the radiative inner zone of the Sun and the convective outer zone. The αΩ dynamo incorporates the effects of differential rotation (which wraps field lines around the Sun) and convection (which twists field lines). Because the rotation rate of Sun-like stars influences field strength, astronomers observe correlations between the magnetic activity (as measured by Hα, Ca II H&K, X-ray, and radio emission) and the rotation rate of F to early-M dwarfs. However, smaller stars at spectral types later than M3 are fully convective and therefore cannot produce an αΩ dynamo because they do not contain an interface between a radiative zone and a convective zone. Several mechanisms have been proposed to explain magnetic field generation in these stars, but the jury is still out on the processes governing magnetic field formation in fully-convective dwarfs. McLean et al. address the question of magnetic field generation in fully-convective dwarfs by comparing the radio emission of ultracool dwarfs to their rotation rates and looking for correlations between radio emission and rotation. They observed 104 M and L dwarfs for 1 hr each at 8.46 GHz using the Very Large Array. McLean et al. detected radio emission from four objects (spectral types M6.5, M7, M7, and M8) and placed upper limits on the radio emission of the remaining 100 objects. 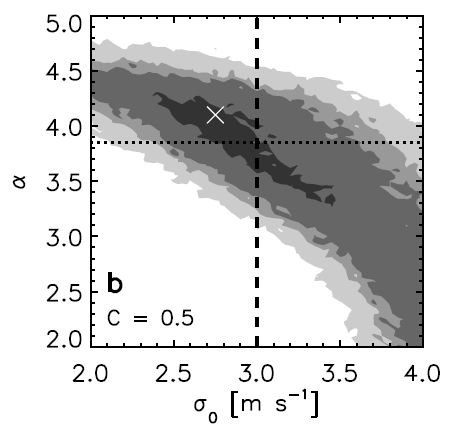 The ratio of radio to bolometric luminosity for all of the targets in the McLean et al. sample is plotted in the figure below as a function of spectral type. The ratio of radio to bolometric luminosity increases with later spectral type. 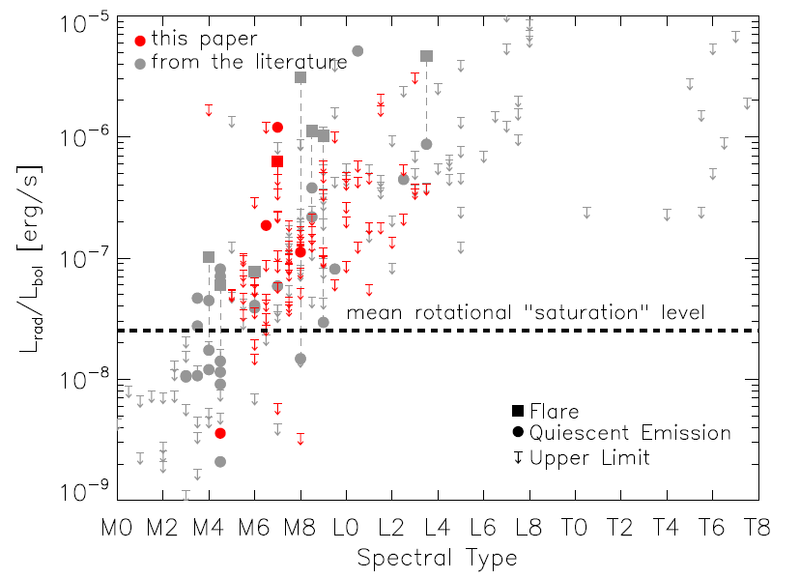 The ratio of radio luminosity to bolometric luminosity versus spectral type for the dwarfs in the McLean et al. sample (red points) and dwarfs from the literature (gray points). The squares mark flares while the circles mark quiescent emission. Upper limits for objects without measured radio luminosities are shown as downward arrows. Figure 2 from McLean et al. 2011. Next, McLean et al. compare the radio luminosity of the dwarfs as a function of projected rotation velocity. They do not find an obvious trend in radio luminosity with projected rotation velocity, but they note an interesting deficit of objects with fast rotation rates (vsin > 30 km/s) and low radio luminosity (<10^23 erg/s). After scaling the radio luminosity by the bolometric luminosity, McLean et al. find a relation between the ratio of radio to bolometric luminosity and the projected rotation velocity. For the early- to mid-M dwarfs (M0-M6.5), the ratio of radio to bolometric luminosity increases with projected rotation velocity until the ratio saturates at 10^(-7.5) for projected rotation velocities above 5 km/s. For the later dwarfs (M7-L3.5), the ratio also increases with projected rotation velocity and reaches higher values of ~10^(-6.4). As shown in the following figure, the relation between the ratio of radio to bolometric luminosity and the projected rotation velocity displays more scatter for the later type dwarfs than for the early type dwarfs, which indicates that the relation between radio emission and rotation rate breaks down at late spectral types. 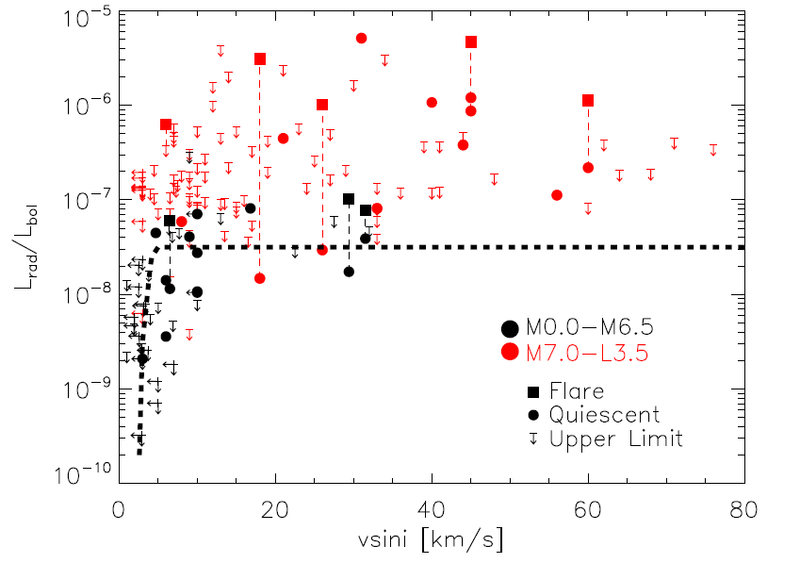 The ratio of radio luminosity to bolometric luminosity versus projected rotation velocity for M0-M6.5 dwarfs (black) and M7-L3.5 dwarfs (red). Note that the luminosity ratio for the earlier dwarfs saturates at 10^(-7.5) for projected rotational velocities above 5 km/s while the ratio for the later dwarfs increases to ~10^(-6.4). 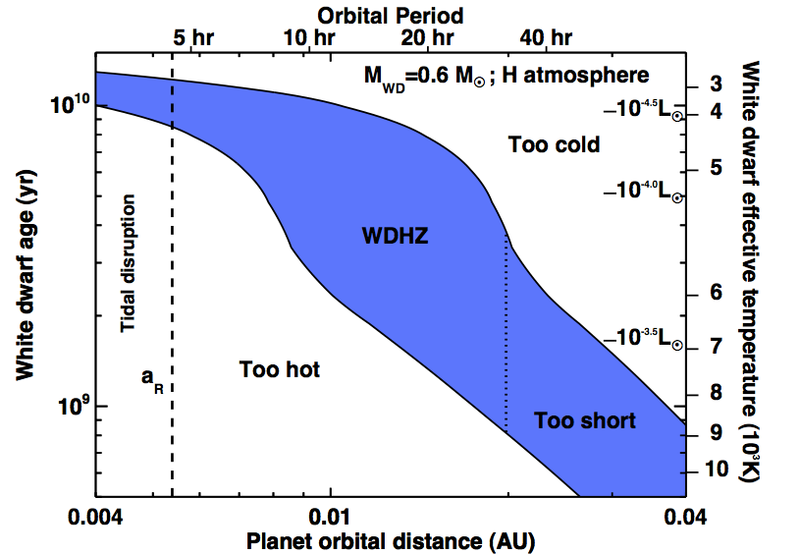 The dashed line is a fit to the radio activity-rotation relation for the earlier dwarfs. Figure 5 from McLean et al. 2011. McLean et al. also find that the fraction of objects with detected radio emission increases with projected rotational velocity, which indicates that rotation rate plays a role in whether an ultracool dwarf emits at radio wavelengths even if the level of radio emission does not scale with rotation rate. The final three figures of the paper display the radio luminosity, ratio of radio to bolometric luminosity, and radio surface flux to the Rossby number of the stars. The Rossby number is the ratio of a star’s rotation period to the convective turnover timescale and is a useful number for predicting the activity of F to early-M stars. McLean et al. show that the trend of increasing radio activity with decreasing Rossby number (increasing rotation rate) continues for later spectral types, but that the relations between Rossby number and X-ray or Hα activity breakdown for spectral types later than M7. As shown in the figure below comparing the radio, X-ray, and Hα activity ratios as a function of Rossby number, McLean et al. find a single unsaturated trend in radio activity with Rossby number. 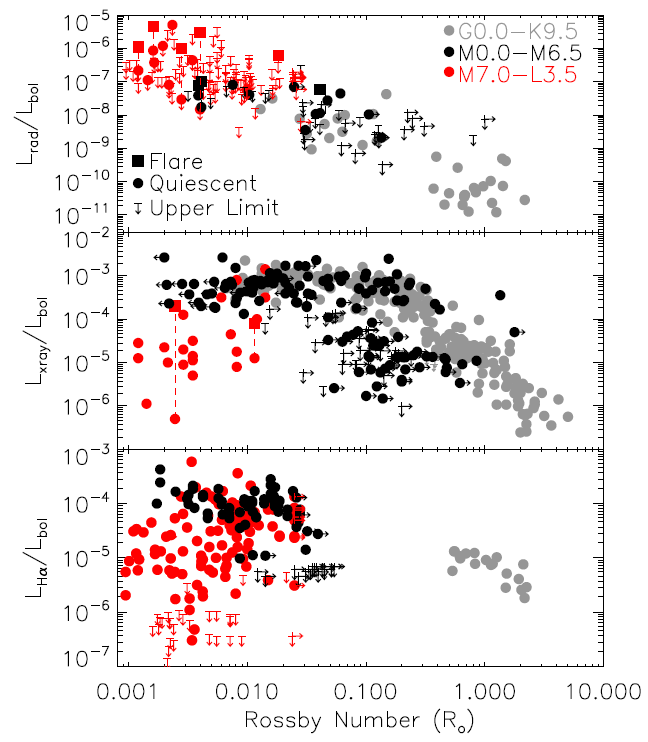 The ratio of radio (top), X-ray (middle), and Halpha (bottom) luminosity to bolometric luminosity versus Rossby number (the ratio of the stellar rotation period to the convective overturn timescale) for G0-K9.5 dwarfs (gray), M0-M6.5 dwarfs (black), and M7-L3.5 dwarfs (red). The trend of increasing radio activity with decreasing Rossby number (top) extends over the whole spectral range from G0 to L3.5, but the relations between X-ray and Halpha activity and Rossby number break down for later spectral types. Figure 9 from McLean et al. 2011. The relations that McLean et al. find between radio activity and the fraction of stars with radio activity as a function projected rotation velocity and Rossby number indicate that rotation influences the magnetic activity of ultracool dwarfs. However, the existence of quickly rotating ultracool dwarfs without detected radio emission implies that there could be more than one mechanism governing the magnetic activity of fully-convective dwarfs or that there is a single mechanism that could result in a range of field strengths and topologies. Future observations of ultracool dwarfs with the Expanded VLA will allow astronomers to better probe the magnetic dynamos of ultracool dwarfs.